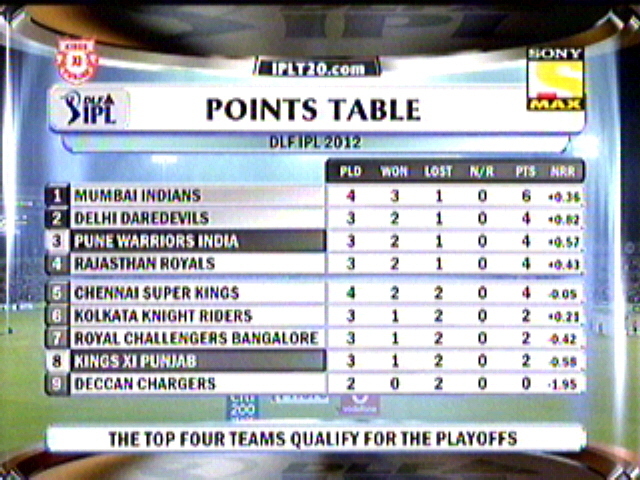 It’s been a fantastic day in IPL 5, One of the best match of this season has gone through. And again Dhoni lost the coin and had to field first in Chepauk, having lost their previous home game, they needed to win this in front of their home crowd, and also the fortress. Both Mayank Agarwal & Gayle gave a good fifty run start, surprising Gayle being the dormant partner. But thats all the time he kept himself quite and from then he swung his bat in all directions to make a carnage in Chennai’s bowling, 162 came up in 16 overs, he notched up 100 runs partnership between Kohli. However, close to 220 was always on, unless 5 wickets fell of the last 8 balls bowled, it didn’t help the cause. 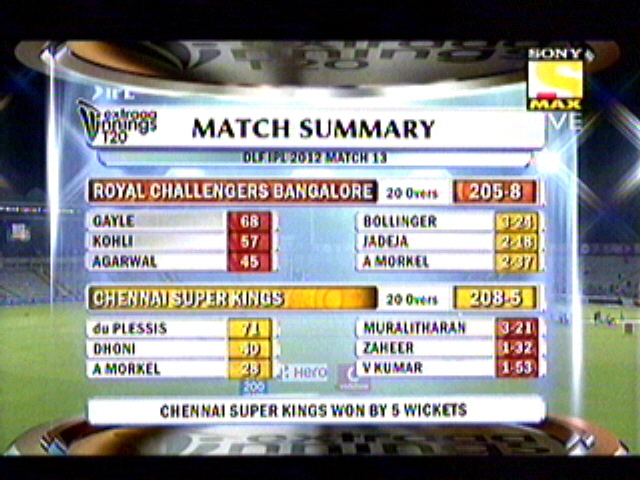 which meant RCB were 205/8 in 20 overs. A very good score in any T20 game. Having to chase a big score, Chennai needed a good start and finally they got that with first fifty run partnership, but its the old veteran Muralidharan, who previously played with Chennai, claimed Murali to a blinder return catch. Raina flexed his muscles for time, but couldn’t stay long though, Dhoni promoted himself up the order cam smacked few before mistiming a helicopter shot. It boiled down to Bravo & Morkel, who has to face the penultimate over of Virat Kohli… And what has happened six balls after that was a massacre Kohli can’t take it off from his dreams. He pummeled 28 runs of that over, leaving 15 to get in the final Vinay kumar over. Having scored 28 runs, Chennai managed the 15 runs in the last over thanks to Bravo’s one hand sixer, and Jadeja’s kitchen sink style shot to win the game in the very last ball. It was a cracker of the day…. Having won the other two games Dada will like to make it a hat-trick, and Gilly and team doesn’t want the same to be in the losing front. Gilly won the coin and decided to field first in a good bowling pitch, and Mascarnenhas made the best use of the condition and picked up his first 5 wicket haul in IPL. Which meant PWI got bowled out for 115 in 19 overs. Having to chase less than 6 runs an over, is always a good deal, but not if u lose the wicket on the very first ball of the game. From then its Aussie’s time as both Marsh and Gilly stitched a 50 runs partnership between them, before losing out. Marsh never lost this cool, he was calm and the glimpses of IPL season 1 began to show in his class. Not much support needed from other end in a low score chasing game, still Chawla stayed there to finish the game for Kings XI Punjab and to bring the dimple smile out of Preethi Zinda’s face. 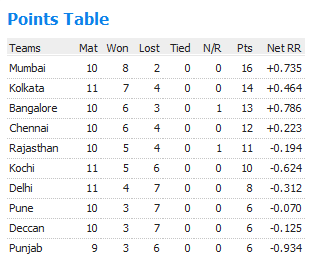 – RCB registered the fastest team fifty of the season by scoring in 4.5 overs, bettering KKR’s 5.1 overs. – 97 runs in first 10 overs is the highest total in the first 10 overs for this season. – 109 runs between Gayle & Kohli is the highest of this season also the first 100 runs & above partnership. – 56 runs for the first wicket is the first fifty runs partnership between Murali & Faf Du Plessis. – 23 sixes scored (12-RCB & 11 CSK) is the Most sixes in any match in IPL history so far. – 28 runs in 19th over is the highest scored in an over for this season. – Second 5 wicket haul in this season, Ravindra Jadeja was the other who took 5 wicket haul this season, against Deccan Chargers. – Second time in IPL 5, a wicket has fallen on the very first ball of the over, this time its Paul Valthathy, and last time it was Murali Vijay running short. – Shaun March became the quickest to reach 1000 runs in IPL, in just 21 innings. – 50 runs scored by Chris Gayle in 27 balls is the fastest fifty for this season, bettered 28 ball fifty by Gambhir. – Parvinder Awana made his debut for KXIP. – Shaun Marsh scored the 150th Six of IPL 5. – 413 runs scored as the aggregate is the highest ever for this season, bettering yesterday’s aggregate of 367 by Rajasthan & Mumbai. – Second game of this season to finish in the last ball of the match. 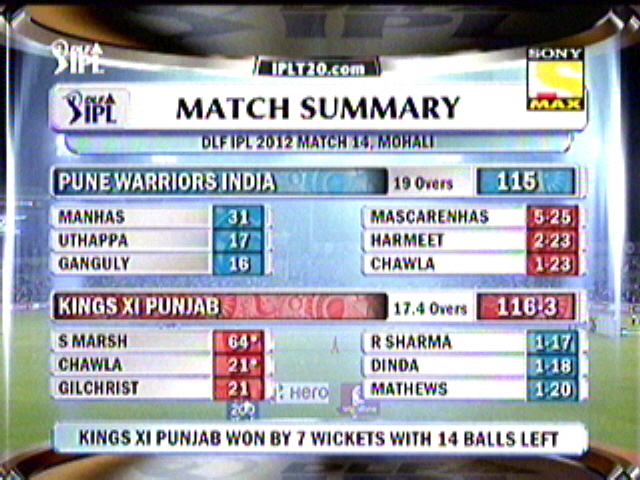 – Pune Warriors became the first team of this season to bowl their innings without even offering a single extra. – With 6 sixes, Gayle scored the maximum no. of sixes by an individual in an innings, bettering Bravo’s 5 sixes.